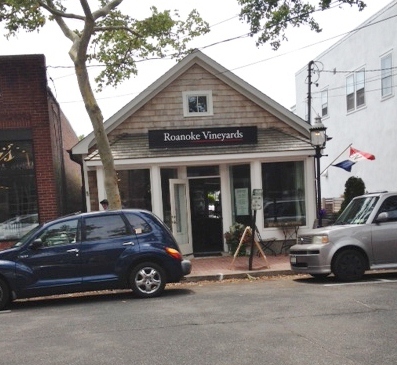 Roanoke’s main tasting room and vineyard are located on the western edge of the North Fork, but their satellite spot, which they call their “wine bar,” is in the heart of wine country, on Love Lane in Mattituck. As I found out, their main room will close this winter to all except wine club members, so you might as well plan to go to their Love Lane place—especially since Love Lane itself is worth a visit for the Village Cheese Shop, Lombardi’s Italian market, and Love Lane Kitchen restaurant, among others. 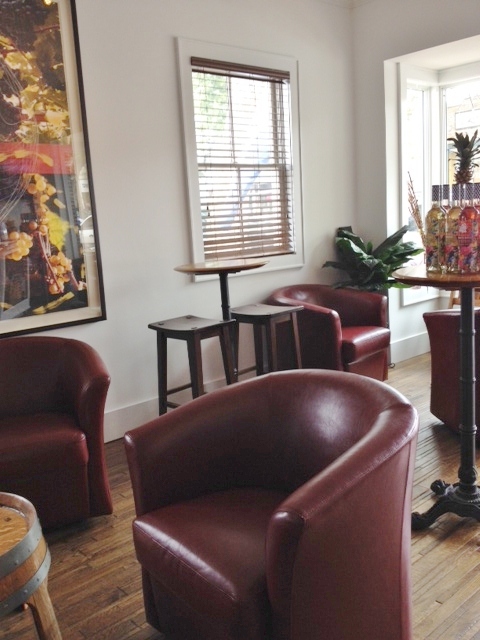 The wine bar is a small room, but it is well laid out, with a bar along one side and comfy chairs around tables, as well as a small piazza out the back, overlooking the Love Lane parking lot. 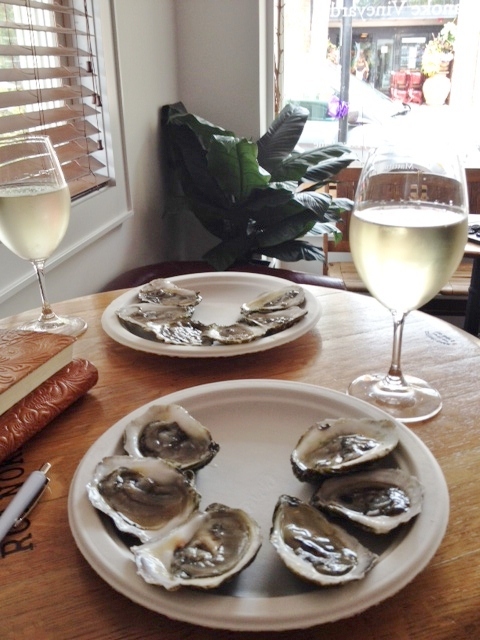 We happened by on a Sunday afternoon, when local Pearl River oysters were on offer, so we decided to partake of some after our tasting ($20 for a dozen). 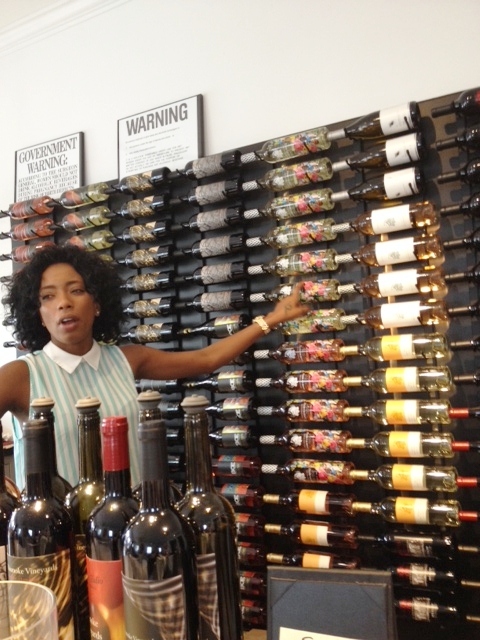 In addition to their own wines, they also carry bottles by Wölffer Estate (on the South Fork) and Brooklyn Oenology. In fact, the last time we were there they were doing a side-by-side tasting with Brooklyn Oenology, which we quite enjoyed. They also carry their own verjus, a non-alcoholic drink people sometimes use in salad dressing or cooking. 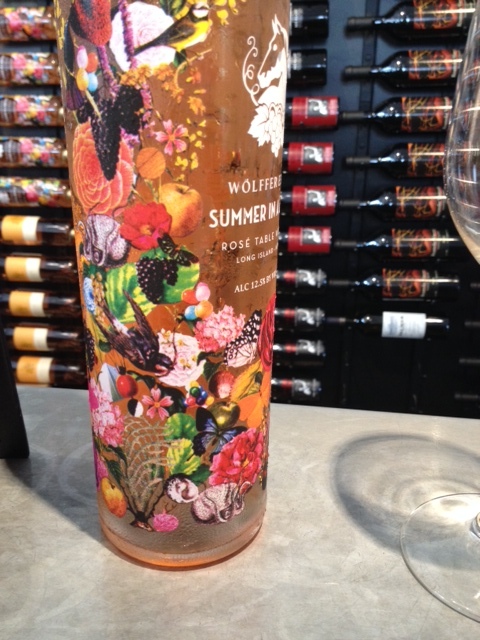 We didn’t get to try this Wolffer Estate wine, but we really liked the bottle. 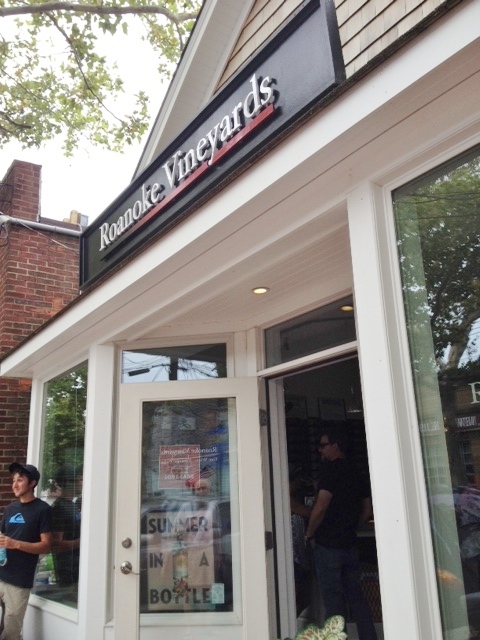 Their menu offers three options, the “Round Trip,” featuring a white, a rosé, and two reds for $12; Whites, four whites for $12; or Reds, four reds for $14. We opted for one each of the white and the red, so we could try all their wines. The pour is fairly generous. Our server was enthusiastic and friendly, fairly well-informed. In addition, she did a very nice job gift-wrapping a pretty bottle of a Wölffer wine for another customer. The server helping another couple choose some wines to bring as gifts. This is a bit tarter than the usual North Fork sauvignon blanc, with a bit of a woodsy aroma and some tastes of kumquat and lemon. My husband immediately plans to have this when he gets his oysters, but I’m not sure I like this. I think I like the Jamesport sauvignon better. The server informs another couple at the bar that this is their top seller, at least this summer, and I can see why. 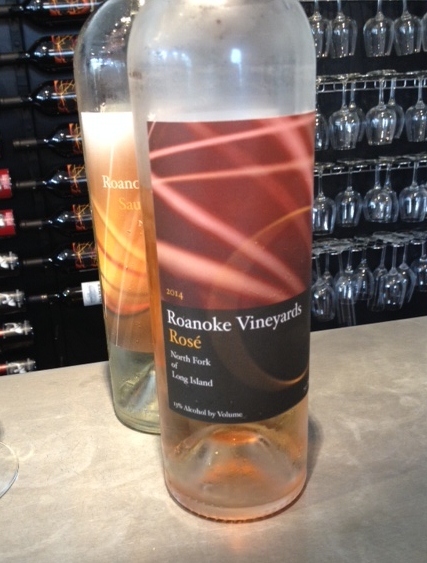 It is a very light rosé, a blend of 75% merlot and 25% “wild” chardonnay (about which more in a moment), with an initial “rush of sweetness,” according to my tasting buddy. I taste not fully ripe cantaloupe, which is in my mind because that’s what we got at a farm stand this week. Good, but we still prefer Croteaux. What is wild here is the yeast, meaning that the wine is fermented using only naturally occurring yeasts, a process I find fascinating, since the winemaker gives up a bit of control over the process by doing this. I quite like this one, though the aroma is a touch musty, with maybe a hint of pencil shavings. The taste is a little sweet, with some honey and citrus, but not too sweet. I decide I’ll have this with my oysters, even though the sauvignon is actually a better fit. I really liked their label designs. Since brio means vivacity or verve, I’m interested to see whether this wine has these qualities. 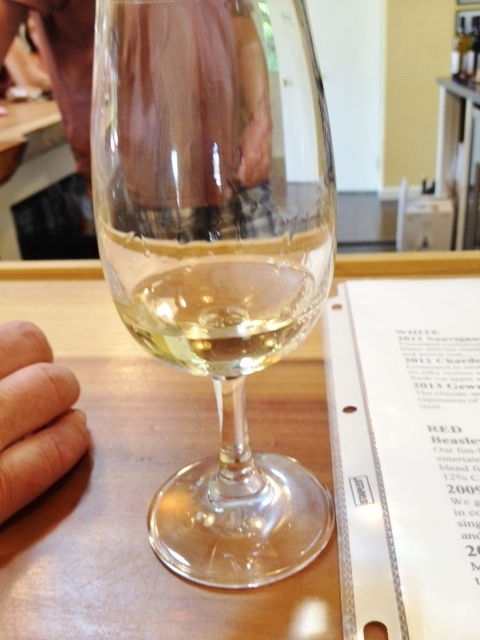 It is a blend of 66% chardonnay, 14%viognier, 8% malvese, and 20% muscat canelli, according to the menu. That doesn’t quite compute, according to my math-challenged mind, but the result is interesting. The aroma is complex, with a touch of toffee, a bit of funk, plus more. “Lots going on,” says my husband, who doesn’t particularly like the wine. I disagree. I taste apricot and gooseberry, and like it. I also like that the whites are not served too cold. Now we switch to reds, and get a fresh glass. According to the menu, this merlot is “blousy,” and after some hilarity with clothing puns, we decide we have no idea what that means in terms of this wine. The wine spends 20 months in French oak. 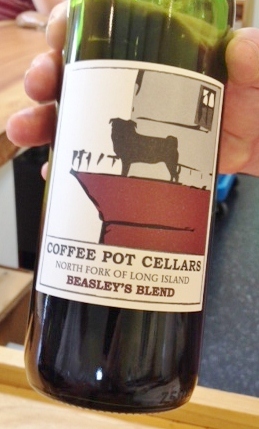 Aroma has a touch of barnyard, but also cherry, and the taste is the typical cherry taste of North Fork merlots, with a bit of tannin at the end. 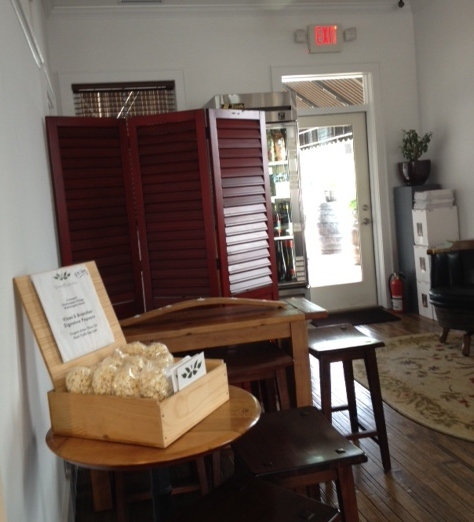 Another view of the room, featuring bags of Vines and Branches’ very popular truffle popcorn. I figure there must be a story behind this name, and indeed there is. The wine is named for the owner’s father, who recently passed away at the age of 99. “He drank wine every day!” our server informs us. Sounds like quite an endorsement for wine drinking. This is a wine one could easily drink every day, with an aroma of cherry and dark fruit and a light delicate taste. 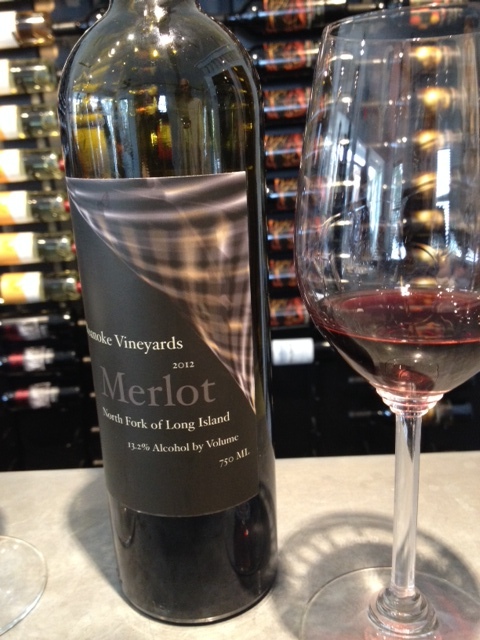 It is a blend of 59% merlot, 39% cabernet franc, and 9% petit verdot, and spends 14 months in French oak. Although this is labeled cab franc, the menu informs us that this too is a blend, of 79% cab franc, 20% merlot, and 1% petit verdot. There’s some cherry in the aroma, thanks to the merlot, but also plums and spices, perhaps allspice. This is very good, and I could see drinking it with boeuf bourguignon—soft, with lots of fruit and a bit of woodiness. One more blend—63% cabernet franc, 22% cabernet sauvignon, 9% petit verdot, and 6% merlot—and the fact that it is a blend and the choice of the name are both appropriate. They called it “Bond” to commemorate their opening on Love Lane, as a thank you to the other local merchants and how welcoming and friendly they were. 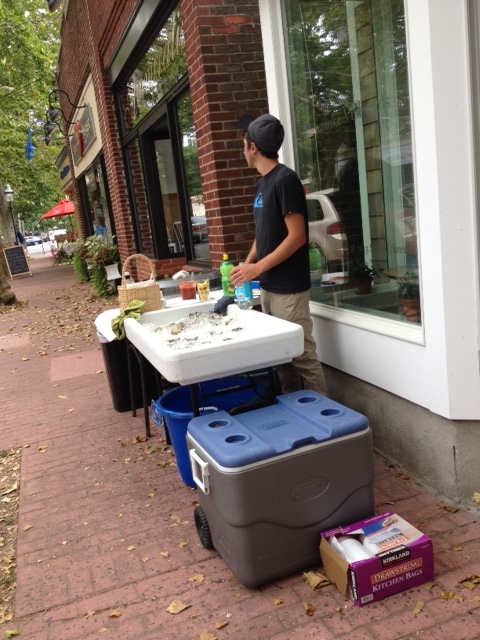 We actually saw that friendliness in action when we ordered the oysters. The owner of Pearl River asked my husband if he wanted lemon, and then offered a squeeze of “Realemon,” which my husband declined. Before we had a chance to eat any, he reappeared with some lemons which Lombardi’s had given him and which he quickly sliced for us. How nice. And so were the oysters—oh, and so is Bond! I really liked it, though our server opined that it would be even better in a year or two. The aroma is quite fruity and the taste has a good balance of fruit and tartness. Reasons to visit: a convenient location on Love Lane—you can buy a bottle and then stop in to the cheese shop and put together a picnic (I recommend Bond to go with your cheese. ); The Wild!, Brio, Marco Tulio, Cabernet Franc, and Bond; oysters on Sunday afternoons; you can buy bottles of Wölffer Estate and Brooklyn Oenology wines as well. Our oysters, waiting for the lemon to arrive. I had The Wild!, but I have to admit that my husband’s choice of the Sauvignon Blanc was a better match. 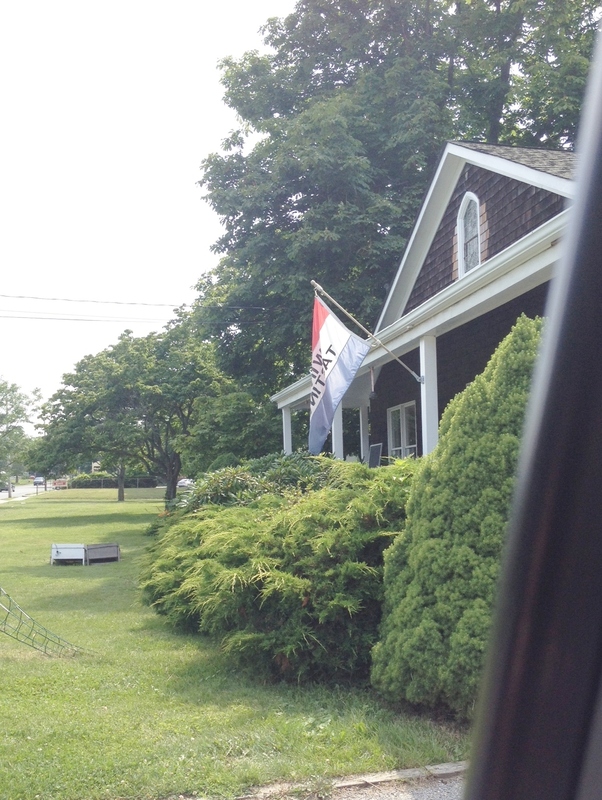 Stroll Love Lane in Mattituck and you can visit some cute shops for gifts, food, cheese, and wine. The cozy building that houses Coffee Pot Cellars–where they do not sell coffee. 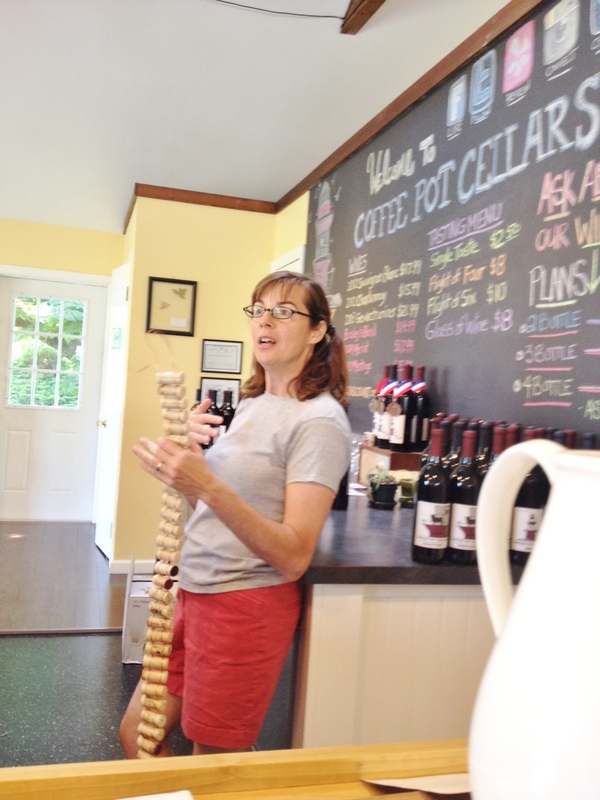 “So, the way to grade a wine is this: you bring the bottle to a party. At the end of the night you look to see—if the bottle is empty, it was good. 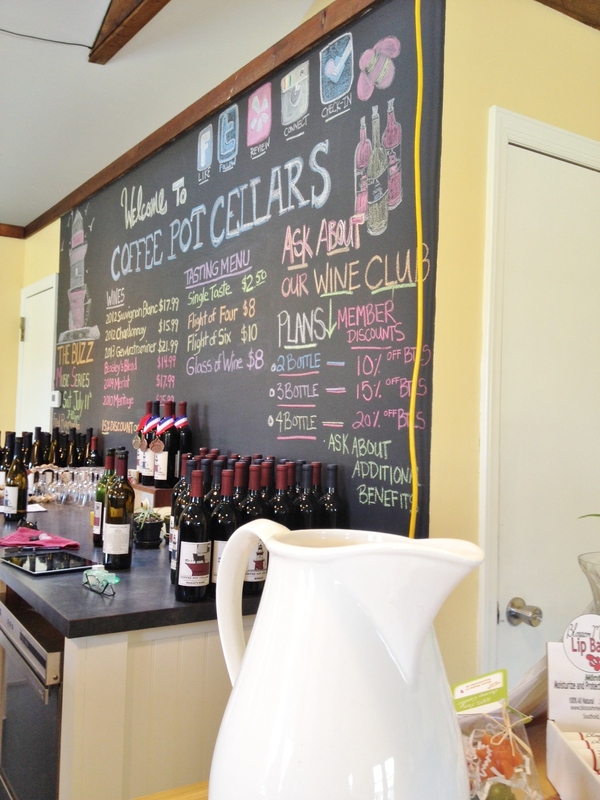 But if it is still half or three quarters full…” All of us gathered at the bar of the Coffee Pot Cellars tasting room chuckled at Adam Suprenant’s joke, one of a number of humorous comments with which he entertained the small group. No joke, however—if you bring one of his bottles of wine to a party, don’t expect to take home any leftover wine! Since he first opened three years ago, Adam has expanded his list from four wines to six, all made from grapes which he sources locally (since he doesn’t have his own vineyard). The winemaker for Osprey’s Dominion, he notes that they pay him to make their wines, and then he pays them to use their facilities to make his wines. Making his own wines gives him a chance to express his own taste and creativity, and he does very well. We liked all six. 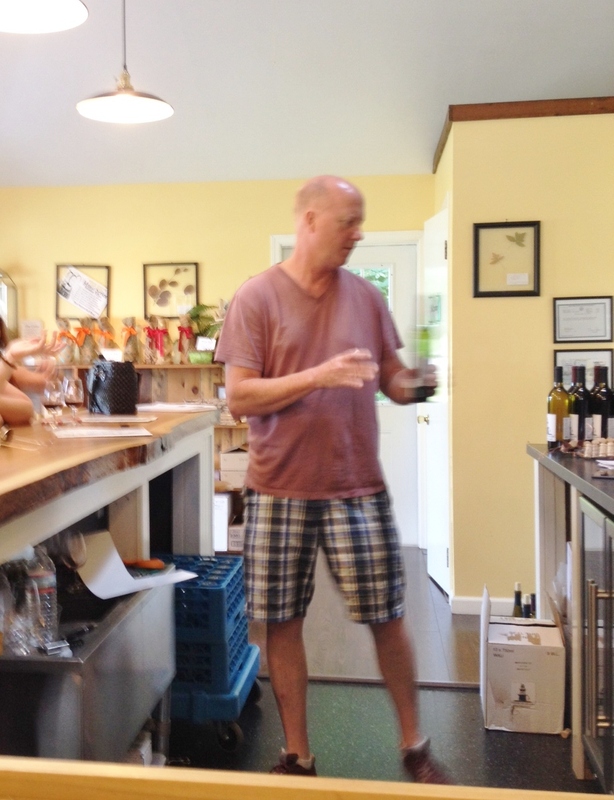 The small, cheerful yellow tasting room is in a small building on the Main Road, and consists of a bar and some stools, plus shelves featuring wine-related items but also many honey products from the bee-keeping business Blossom Meadow run by his wife, Laura Klahre, who is also a very likeable presence behind the bar. 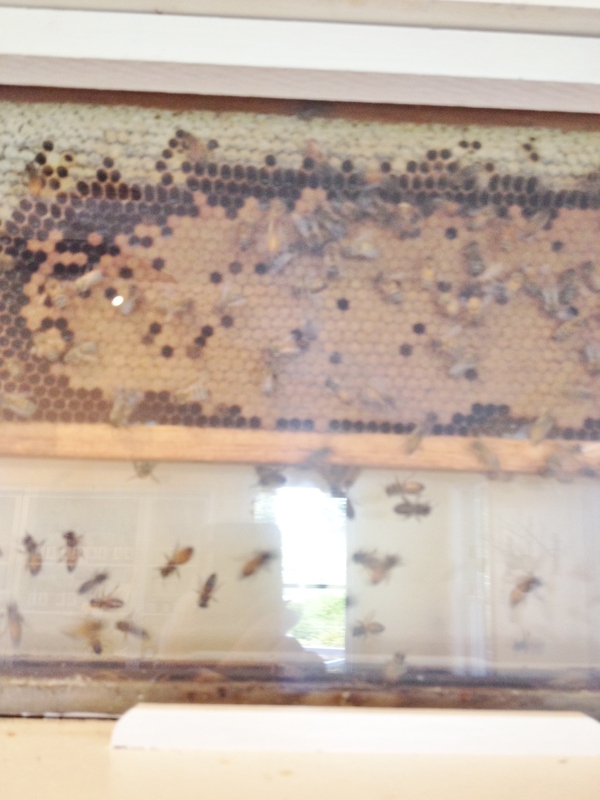 On one wall you can see a beehive behind glass, and Laura will happily explain to you what exactly is going on in it. 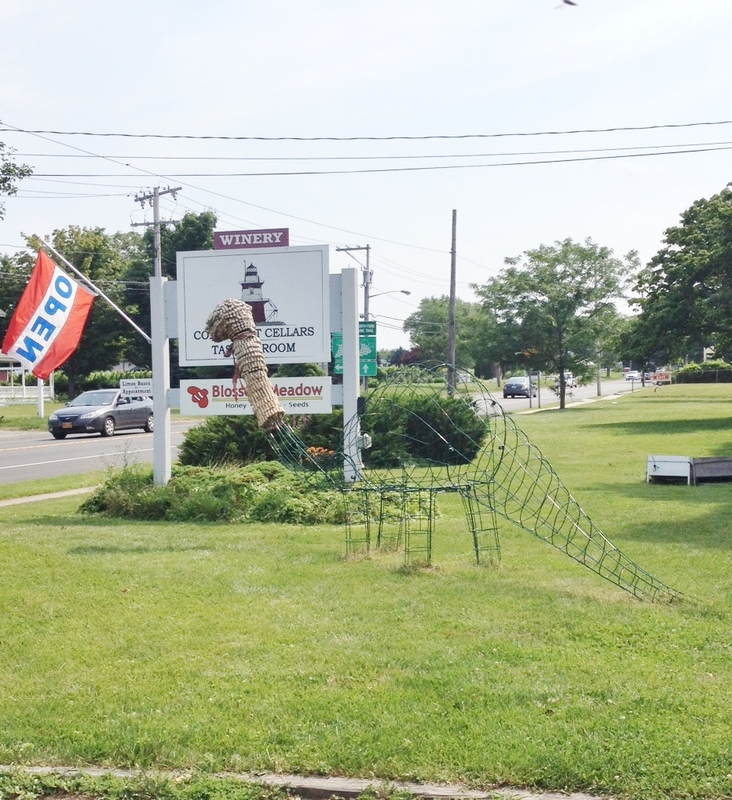 She is also in the process of creating a “Wineosaur,” a wire sculpture on the front lawn which she is creating using corks. Some day she hopes to attach it to some skateboards and join a local parade. Tasting options include one for $2.50, four for $8, or all six for $10. A glass is $8. We decide we will each get our own tasting. 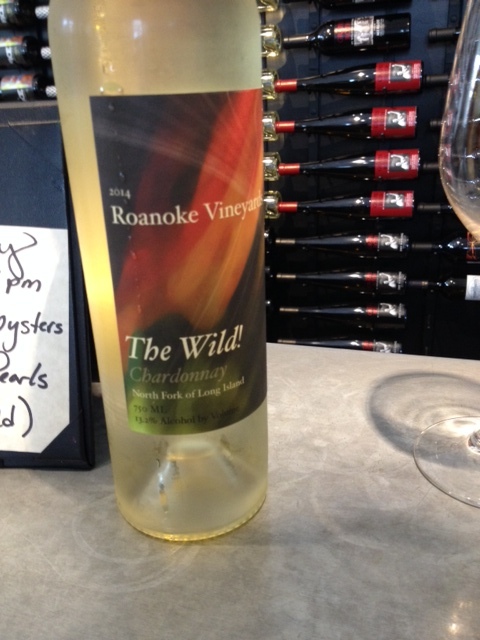 This is a fairly typical sauvignon blanc, steel-fermented, with lots of citrus flavor. I also feel as though I smell some honey or honeysuckle. It would go great with some Pipes Cove oysters. Apropos of grades, we are informed this scored an 89 in Wine Advocate. We like it. This is the chardonnay he didn’t plan to make, which ended up being a prizewinner. The 2012 is almost sold out, and the 2013 will be released this week. Adam apologizes that they are not yet serving it, because he thinks it is a terrific wine. The 2012 is not so bad! Because he uses ten-year-old oak barrels, it is not heavily oaked at all, with only a slight butterscotch aroma and taste. We taste LOTS of ripe pineapple, and though there is some sweetness it is not at all cloying. Good. Gewürztraminer can be too sweet or not sweet enough, but this one is just right. It is fairly refined, with aromas of honeysuckle and lychee and tangerine, reminding me of dessert in a Chinese restaurant. Yet it is also dry. Also good. Adam notes that he sources all the merlot grapes for this wine from McCullough’s vineyard, so that it can express the terroir. We smell smoke and cherry, and taste cherry. This is nice and dry, and would complement pasta really well. A blend of 59% merlot, 23% petit verdot, 14% cabernet franc, and 4% cabernet sauvignon, this wine also got a high grade—a 90—from Wine Advocate. And, Adam adds, he feels it is yet 3-5 years from its peak, so this may be a good wine to store in the cellar for a while. We like this one, too, as it is dry with good dark fruit tastes, but my notes are a bit sketchy because at this point we were the only people left in the room and Adam revealed that he likes my blog. Outed! Nice to know I have a reader aside from my nearest and dearest. We decide to buy a bottle of the Beasley’s Blend because we are always looking for everyday reds—we eat a lot of pasta—and a bottle of the 2013 Chardonnay so we can try it. We have it with some spicy stir-fried chicken and eggplant I make, and it is delicious. Quite different from the 2012, though it also has a slight butterscotch aroma and flavor, this is much more balanced, with less of a pineapple taste and a touch more citrus—maybe Meyer lemon? I think I’d really like it with some grilled salmon. 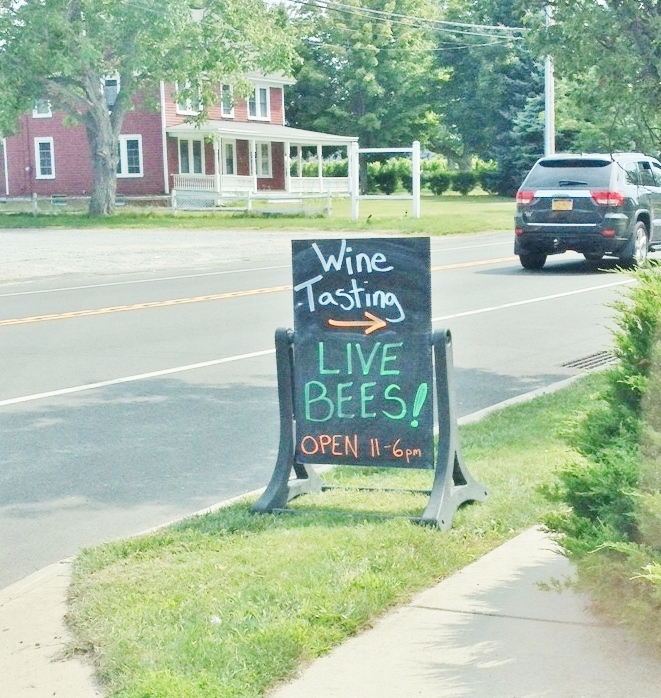 Don’t worry, the bees are behind glass. Reasons to visit: Adam and Laura, still wine-country’s cutest couple; all of the wines, but especially the Sauvignon Blanc, the 2013 Chardonnay, the Beasley’s Blend and the Meritage; honey and honey-related items, including beeswax candles in all shapes and sizes; a nice small room where you can really talk to the owner/wine-maker and learn about wine (and bees–which got me wondering, should they try their hand at making mead? ).